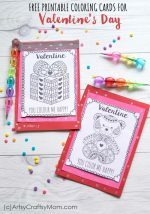 Treat your valentine to a unique handmade Tic-Tac-Toe XOXO Valentine Card to make them feel extra special and really loved! 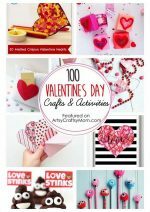 Valentine’s day will be here before we know it. The holiday where we express how much we love and care for each other. 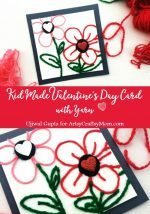 What better way to do that than with a handmade Valentine’s day card! Glitter foam alphabet stickers – X & O’s 5 each. 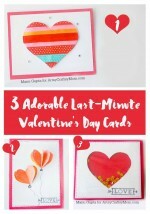 Cut & fold the cardstock to size. We folded a 12 x 8 inch white cardstock in half along its long edge to form a 8×6 card. For the first step, Take a washi tape and add the first row of the 3×3 tic-tac-toe grid. Then place the 2nd tape, carefully measuring the same lenght as the first, about 1 inch below it. We used a different shade for the vertical lines. But you could very well use the same color too. We made one card with red & lavender and another with red & pink washi tapes. Now is the time to place the Xs & the Os. You can paste the red heart in the center or in the right bottom as shown above. Now place the Xs at the corners & middle. and the Os in the remaining slots. We printed our message ” Love You FOREVER” but you could use a stamp or write your own message with markers. Hugs, kisses, and hopelessly stuck on you. 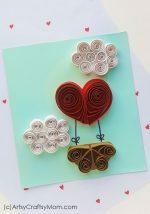 Now isn’t that a simple & fun card to make?